If you need a feature rich ultra lightweight hiking pack that has it all, this Gregory Optic 58 Pack Review is for you. This is an impressive pack from a new 2018 series, which comes with a bonus rain cover. Gregory Optic 58 Hiking Backpack. Ventilated dual-density shoulder harness and hip belt. Impressive hip belt and lumbar zone padding. The Optic 58 is a part of a completely new series launched for the season 2018, which includes also the Optic 48 and the corresponding versions for women, Octal 55 and Octal 45 liters. This is a top loading pack with a classic lid, which is floating type and also removable for a stripped weight. But when you remove it, you can use a flapjack which is there for this purpose, equipped with buckles identical to those on the lid. Note that this flap is also removable. The top entrance is with a nice quick-release system. 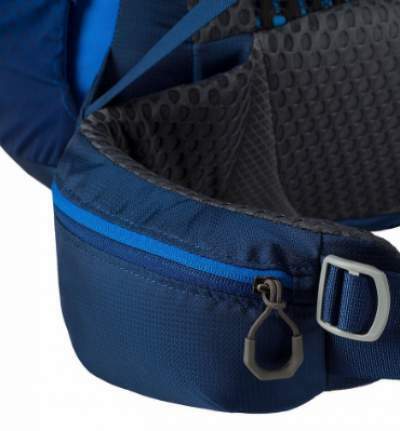 The main compartment contains an internal hydration sleeve and a centrally positioned hose port which allows for routing the pipe along any shoulder harness. Note that the sleeve is huge and very deep, it is of the width and the height of the main compartment. So this is the only entrance and compartment, there is no bottom compartment here. There are many ultra-lightweight packs out there, but this Optic 58 appears to be more feature-rich than many others packs. With such a weight and all the features, this is a perfect pack for backpackers and hikers, and for loads of up to 16 kg (35 lb). Ventilated suspension system with tensioned mesh. The suspension is based on a peripheral 7001 aluminum frame accompanied by an anti-barreling cross stay. 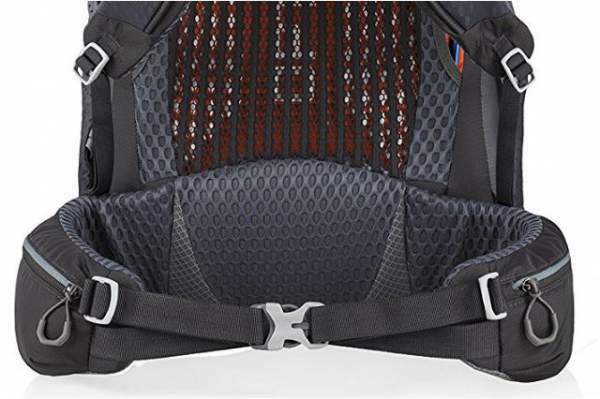 The design is such that it directly transfers the load to the massively padded lumbar zone and to the hip belt which you can see in the picture below. They use dual-density foam, which means they position it strategically depending on the pressure points. As you realize from the pictures, both shoulder harness and the hip belt are generously padded, you would not expect this when you see the weight of the pack. This system is designed for up to 16 kilograms of weight and there is no doubt this construction can easily support such a weight. One feature which adds to comfort and support is the double straps system on the front of the hip belt, you can see it in the picture below, they create a horizontal V-profile with the two straps on each side. So these front straps independently cinch the side padding on the hip belt, I mean both the upper and lower section of it, and this increases the effect of hugging of the hip bones. When you see such a design plus a great padding, you can expect the best support from the hip belt. 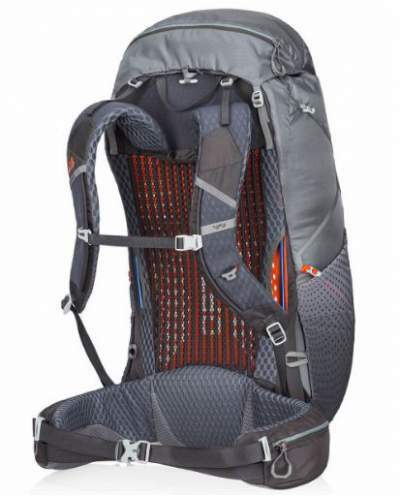 You can see the same design in this Mountainsmith Apex 60 pack. Note that you also have side cinch straps on the hip belt, for pulling the pack against your hips when needed to stabilize the load. So they have done a great job in this section of the pack. You wouldn’t expect such a great padding on the pack which weighs only 1.14 kg. I already mentioned the super ventilated design in the shoulder harness and hip belt. This is indeed better than what you can find in some other ultralight backpacks. The sternum strap is with sliders. Load lifters are also available as usual, so all standard suspension elements are in place here and they work nicely. There is one zippered pocket underneath the lid where you will find a rain cover. So you realize, such an ultra-lightweight pack comes with such a bonus. Yet another zippered pocket is on the top of the lid. On the sides, you have dual stretch mesh pockets with dual top and side entrance points. One large stretch pocket with a buckle is on the front of the pack. It is very stretchy and very large, a huge storage area for things on the go. Dual zippered pockets are on the hip belt, one is shown below. So in total, you have 7 pockets, not bad at all for a pack which is designed to be an ultra light tool. Very useful zippered hip belt pockets. On the top of the pack, underneath the lid, you have a cinch strap to compress the load or eventually to fix a rope which you can carry in such a way. You have inside-out design in the V-shaped lower side compression straps, so you can route them over or through the side pockets. The same V-shape are the upper side straps, in a different color though. This is a great design which allows for storage and carrying some stuff in the side pockets and have it fixed firmly in place. Both straps are rather narrow, but this is compensated with their zig-zagging structure which covers the whole sides of the pack. On the front you have dual attachment systems for trekking poles and an ice axe, this includes loops on the lower section paired with dual bungee cords higher up. There are several attachment loops on the lid and on the front of the pack. 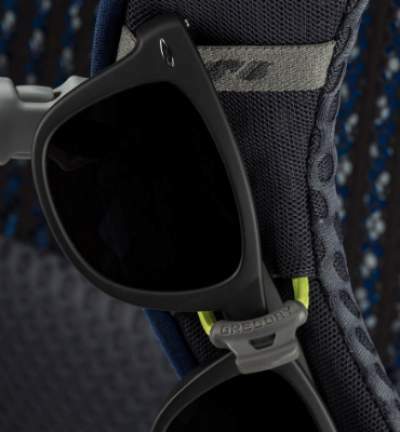 You also have the QuickStow feature for sunglasses on the shoulder harness, it is shown in the picture above. So now you realize how full of features the Paragon 58 pack really is, but all these extra features add the weight. As you see, they have reduced the weight in the Optic pack by 480 grams, yet the Optic 58 still looks so complete and full of features. They did a great job here. I think the ventilation system is slightly better in this new Optic pack. Excellent suspension system and padding. The pack’s weight can be stripped. As of the moment of writing this text, the Amazon price for this pack is $210. It looks expensive, but it is with great features plus the rain cover which adds value – if you would buy it separately it would cost you $35. So the pack alone would be around $175 which sounds much different. The volume to weight ratio for this pack is impressive 51 l/kg, so this is the second highest of all packs reviewed so far in this site, after the Granite Gart VC 60. Note that it is higher than in the Osprey Eja 58. But the Optic 58 is with more features. Type: backpacking & hiking top loading pack. Three sizes: SM, MD, LG. – SM: 2.40 lb (1.09 kg). – MD: 2.52 lb (1.14 kg). – LG: 2.70 lb (1.22 kg). – SM: 2.29 lb (1.04 kg). – MD: 2.42 lb (1.10 kg). – LG: 2.57 lb (1.16 kg). – SM: 3356 in³ (55 l). – MD: 3539 in³ (58 l). – LG: 3722 in³ (61 l). – SM: 26 x 12.5 x 11 in (66 x 32 x 28 cm). – MD: 28 x 12.5 x 12 in (71 x 32 x 30 cm). – LG: 30 x 12.5 x 12.5 in (76 x 32 x 32 cm). Max carry weight: 35 lb (16 kg). – SM: 16 – 18 in (41 – 46 cm). – MD: 18 – 20 in (46 – 51 cm). – LG: 20 – 22 in (51 – 56 cm). – SM: 26 – 45 in (66 – 114 cm). – MD: 28 – 48 in (71 – 122 cm). – LG: 30 – 53 in (76 – 135 cm). – Fabric: 100% nylon 100D & 210D. In general, if you are a very slim person, it is best to size down. If you are a big person, size up. See how the Optic 58 pack compares with two other ultra-lightweight packs. Clearly, those packs are not a match, it has more features plus the rain cover. Here are only a few of my arguments for such a statement. The Exos 58 has a great ventilation system (note, this is the new 2018 version of the Exos pack, completely the same as in the Eja 58 pack), and it is better than the Optic 58; but the frame in the Optic pack is a stronger and a more functional design which better supports the load. On the other hand, the hip belt in the Optic pack is far better than the hip belt of the Exos 58 pack. The hip belt on the Granite Gear Crown VC 60 pack is also very good, but this pack has no frame at all. So this cannot come close to the Gregory Optic 58. So, in the conclusion of this Gregory Optic 58 Pack Review, I would stress that they have built a remarkable backpack. It is so lightweight and yet all you need is there, together with the bonus rain cover. 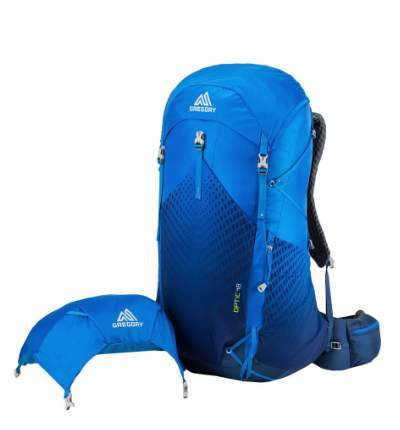 When you see the suspension and hip belt padding on this pack, you can be sure that you can indeed carry up to 35 lb (16 kg) of weight, and you will do this comfortably. They have reduced the weight, but the most important parts of a pack built to carry a load, the frame, the hip belt, and the lumbar zone, are as good as in any other much heavier pack. I can fully recommend it. I am obviously impressed, but I am not biased or paid by the brand, these are my views and impressions of the pack. It is not perfect, a few important things are missing, this is a trade-off, the weight versus features as usual. I have included this pack in my list of the best backpacking packs for men. But if you need a smaller pack, check its smaller cousin the Optic 48 backpack. See also the Octal 45 for women, from the same series. You might want to see how this pack compares with the new 2018 Osprey Exos packs, so check here. If you need a heavier pack for really heavy loads, you might want to check this Mystery Ranch Stein 62 pack with some unique features. Need something very affordable and in the same weight range? Then check this Mountainsmith Scream 55 pack. Thank you for reading. Please let me know what you think, there is a comment box below. Have a nice day. will it fit a bear canister bv500? 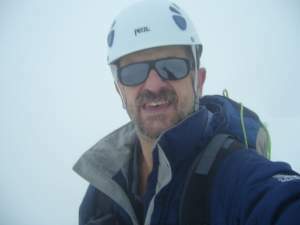 Hi Craig, I have never used a bear canister. This BV500 has dimensions (L x D) 12.7 x 8.7 inches so it will fit easily as long as you put it vertically in the pack.